Single fatherhood is a challenge many arachnids undertake, guarding eggs laid by females despite the costs to their own health and mating benefits, but the news may not be all bad for these dads. New research now shows that, in one species of spiders, males exclusively responsible for guarding eggs actually enjoy survival benefits rather than suffer losses to health or mating privileges. 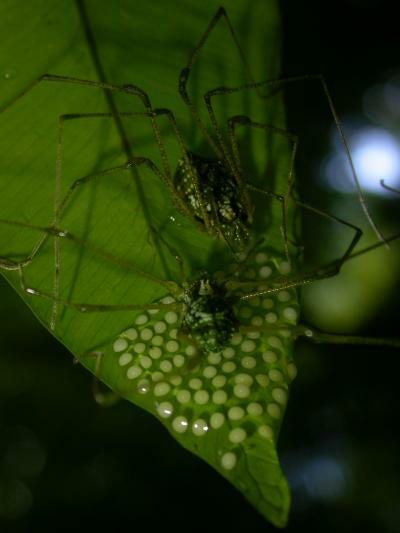 The study, published Oct. 10 in the open access journal PLOS ONE by Gustavo Santos Requena and colleagues from the University of Sao Paulo, Brazil, evaluates the costs and benefits of exclusive paternal care, the rarest form of parental investment in nature, in the harvestman spider Iporangaia pustulosa. The researchers tracked spiders in the forests of southeastern Brazil over the course of a year to observe how caring behavior in males affected their chances of survival or body condition. Though caring males feed very rarely and lose body condition while guarding eggs, the authors found that these spiders suffered no long-term decrease in fitness compared to females or non-caring males. Their sedentary behavior during the caring period also makes them less likely to be eaten by predators, reducing their mortality risk. The authors also suggest that providing females cost-free care for their offspring might make caring males more attractive to females, thereby improving their chances for reproductive success. According to the authors, their results suggest that the reduction in mortality risk, combined with the genetic advantages of improving survival of their offspring, may have played important roles in favoring the evolution of paternal care in insects.